Accuracy and safety are pursued. Compact machine with full functions. 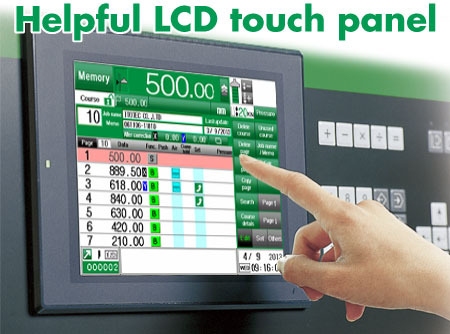 A multi-function touch panel contributes to high quality and speedy cutting operation. Large widths and wide sizes are powerfully cut. Various non-paper materials are supported. Ready-to-use cutting-edge functions are installed in all models. 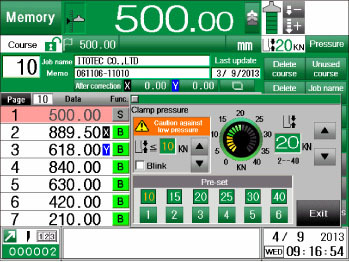 The used/unused course data is displayed on the number panel for every 100 courses. Each course can be easily moved or copied. Job names and memo written in the course can be searched for from the detail course view through AND search. The clamp pressure setting affecting the cutting quality can be entered at the display. Enter a value between 2KN and 40KN in 1KN increments. Variation in the pressure setting can be suppressed. The value can be preset in 5KN increments and the pressure setting can be varied among courses and pages. The pressure setting adjusted for each item and each cutting position can avoid cutting errors caused by pressure errors. A keyboard is displayed on the touch panel. Use it to enter the job name and memo. The keyboard can be selected between JIS and Japanese kana syllabary layouts so that the operator can choose the desired one. A series of backgauge motions are controlled. Best for prevention of workpiece collapse. The general speed, start-up, deceleration and stop can be minutely adjusted. 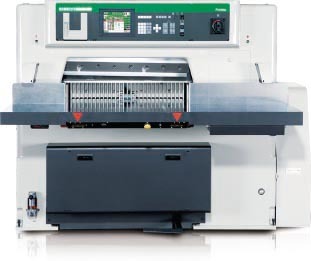 With this new function, the position shift between the cutting data and the print can be compensated for. When the item is cut at the register mark, the shift from the stored data is automatically compensated for and stored in memory. Even though there is a shift in the print position, there is no need to enter the offset again. 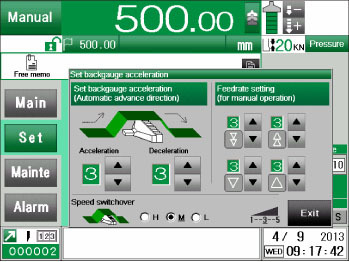 The workpiece setting and paper rotation direction are displayed in a graphic animation. You can work assuredly while looking at instructions on the display. 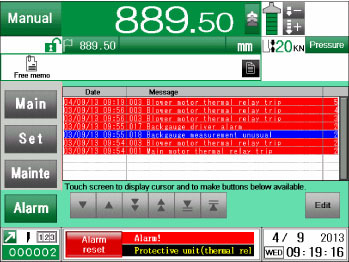 The alarm failure history function keeps memory of the date, time and details of the failure accurately. 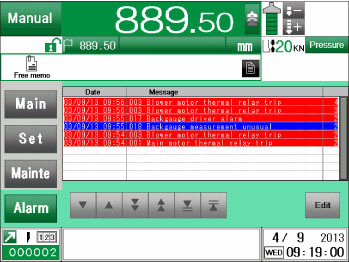 The service personnel refer to this data to comprehend the machine state quickly, so that the maintenance work is speedy. Knife change and oil change notices are displayed with corresponding icons. 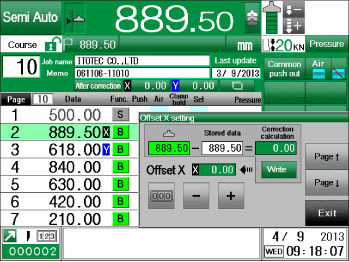 The current state of the cutting machine is at a glance.Knife change and oil change notices are displayed with corresponding icons. The current state of the cutting machine is at a glance. The control panel serving as a core of the eRC Series cutting machine contains the program of functions necessary for the operation of the cutting machine only. It starts immediately when the power is turned on, so that you can start to work immediately. Accuracy, productivity and safety are securely pursued. The two-hand operation type safety unit of the cutting switch and the safety beam guard are installed in all models as standard features. These units have passed model tests based on the Industrial Safety and Health Law enforced by the Ministry of Health, Labour and Welfare. You can simply add Itotec’s genuine “CIP4 Pack” (option) to the eRC cutting machine to realize the function. Air blower valves are installed in the main table and side table. Even large paper can be handled without difficulty. 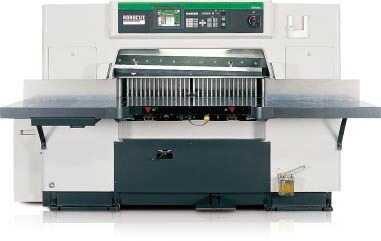 The table top is chrome-plated to suppress rust generation and protect paper from foulness. If cutting is made forcefully with a dull knife or if hard matters such as a metal are erroneously cut, shear bolts built in the left and right rods are broken to protect the machine against damage. If the shear bolt is broken, a limit switch is activated to stop the knife immediately. The cutting line is displayed on paper before the clamp is lowered. The function is helpful when the real-item cutting position is stored. Ascent and descent of the clamp are used to remove the knife of even the large machine easily. A central lubrication pump is installed at each of the main body of the machine and the backgauge. The operator needs to merely activate the pump in addition to oil and grease supplied at several points. Hard balls are arranged at more than 100 points inside the mechanism for moving the backgauge. Smooth rotation generated with rolling friction realizes accurate positioning. The L.M. guide is also equipped with small hard balls to avoid deviation. The soft clamp method, with which the clamp pressure applied upon the press of the clamp pedal is suppressed to a low pressure, is adopted as a standard feature. Designs and specifications are subject to change with/out notice.